Wix Website Builder Review, Would I Use It? 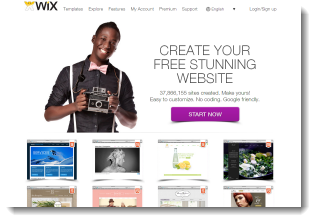 With a good size of great looking templates and a well supported website builder, there is a reason Wix is one of the more popular website builders these days for folks looking to get a hobby website up or a website for their business in place. Though Wix is one of the more popular website builders out there, there are definitely pros and cons to using this platform and I want to walk you through several of these. What Sort of Features Do Wix Websites Have? If you are looking to build a functional website, wix has some features that are very helpful in accomplishing this. Here are some of the features that may capture your interest. The feature set can appear good if you are a complete newbie to website development, but with only 116 apps (add on features) and a drag and drop website editor that is quite limited (more on that in the next section). I have used Wix on a number of occasions (mostly for testing purposes) and I have always been frustrated with one thing, their website editor. I know they have invested a great deal of time and energy into it recently and they have a new HTML5 Editor, but it really feels ‘clunky’ and hard to use. Here is an example site I created, that by the way isn’t too bad at all. I admit, some of the theme designs within Wix are very clan. I have years of experience (11 years now) building websites and I still find their editor somewhat difficult to use. Yes, it has drag and drop features but the inline editing aspects can be frustrating to manipulate at times. The editor gets a relatively low grade, in particular because I am used to using WordPress which is the most widely used website editor/platform in the world (and has had billions invested). If you are new, it can be frustrating and if you have experience, the feature set within the editor can feel constrained. Wix has 357 templates within their platform. These range from hunting templates to templates for innovation and design firms. Below is an example of a couple of these themes. These are good looking sites and they are easy on the eyes. Most are very professional looking and I give Wix a lot of credit for that as some website builders produce absolute JUNK. But I do have one problem and that is the number of templates being only 357. Because the editor and the ability to edit the design of the themes is limited, there is truly 1,000’s of people out there with the exact same look and design of your website. Your website is not going to be unique and if you are trying to create a “business” online or a business website, then you are going to have a lot of others out there with a website that looks exactly the same and since many are branded to themes like “fishing”, you are limited if you want to create a website that is very niche specific. This can be distracting to people that visit your site and will actually take away from your business if you plan on making a site. It is a free site, but there are other platforms (like SiteRubix.com) out there that offer better websites and don’t have this sort of branding. With some of the platforms out there like WordPress having 1,800+ free templates (and 100,000’s for purchase), Wix does quite match up to some of the other website builders in respect to having the ability to create your OWN unique website. Wix is one domain hosting meaning that if you wanted to use their service for multiple website, you would be required to pay for the service. Also, if you want to use most of the features that are available within the Wix website builder. See the “pricing” schedule below to see how much space and domains are allowable. Wix has quite an accomplished support system and there are multiple ways in which you can get support. 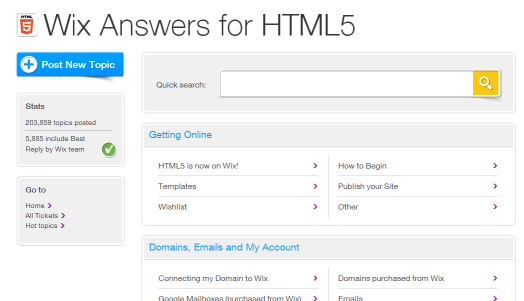 They have a Question and Answer wiki that you can use to get answers and also to “post topics” that you need help on. Wix has a dedicated team fielding questions that are asked relating to websites. For example, here is a question that was answered very quickly by Andrea from the Wix team upon someone having a question about their websites. This is something that is always very important to me as I know how frustrating it can be when you are learning to build a website and you get now help. One thing that is missing, is support for creating your website in a way that will lead to more business, more traffic, and more revenue. The Wix support is focused on the technical aspect of the website only. Again, there are services out there that give you not just the websites, but the training, tools, community and support you need to run a business. The Wix pricing varies depending on the plan. They have a totally free, but very limited option that you can use to build a free website. This is essentially your taste test of what you can expect with the website builder. All free websites are heavily branded with Wix.com advertising on it. Here is a break down of the pricing (click image to see full size). 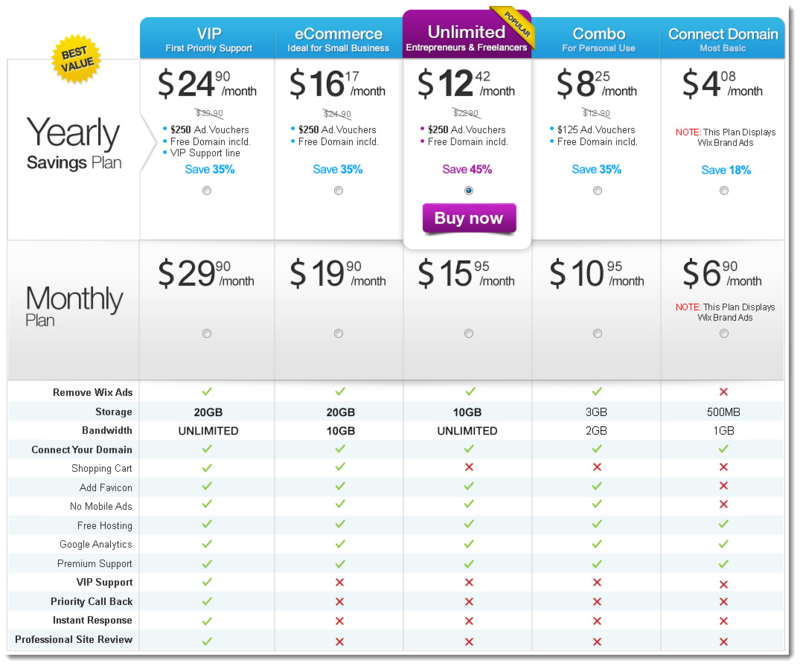 As you can see there are 4 different pricing plans, so according to your needs, you would choose appropriately. These plans vary in size and affordability, with the most expensive plan, VIP, having access to the most features at $29.90 per month. This is relatively expensive for only being able to host single domain. If you wanted to host more sites, you would need to buy additional plans and this can start adding up. Me myself, I have MANY websites and I want a solution where I can build and host ALL of my websites in one place and do so on a single plan. Because of this, I highly recommend using getting an UNLIMITED PLAN over at SiteRubix.com, the service I recommend you use for building all of your websites. Get 2 Free, “no ad” Websites Here! The Wix Website Builder is good. Wix however, comes with some major drawbacks and there is a reason it is not the top used website platform in the internet business community (WordPress is). This is usually and indicator that it is lacking in some areas and some of the more evident ones are the number of website templates, the difficulty that the editor is going to present those that are non technical, and the layers of “promos” they put on your website even for the low end paid memberships. Bang for your buck, Wix is a pretty decent service, it just isn’t your best option (this is). It does lack a lot of what my top ranked website builders do, including the Internet business training and support, the tools for building your business, the community, and the ability to leverage 1,000’s of website templates and 10,000’s of features that you can plug-in. Want TWO Free Websites? Access the Website Builder that I Recommend Here! When you subscribe to their Yearly Unlimited Premium plan, their website says that you get 2 free premium apps which are Site Booster and Form Builder. I only used the Site Booster and I was just charged a total of $9.90 for 2 months of service ($4.95 monthly service charge). Nowhere in their advertisement says that there will be a monthly charge at all for the service and that is why it says you get it for free with your subscription. This is clearly, false advertisement! As of now I have cancelled my subscription for the Site Booster so I won’t get charge again. When I called customer service about this was told that you only get a credit for the first month of service. Again, nowhere that is mentioned. They issued me a credit for this charge. I wished that I haven’t paid in full up front as is required for the year for the yearly subscription for their service. As of now is “wasted” money since I can not get a refund for it and is paid until it expires for the yearly service. As of now I am looking for another company to design my website with and won’t be using Wix anymore. I also haven’t finished designing my website completely yet. Sorry to hear about the deceptive marketing practices you experienced with Wix, I think that you offering your insights here will save a lot of people money/time. Unfortunately this sort of elusive marketing is taking place everywhere you look in the hosting industry these days (and in the website builder side of things as well). Pricing that goes up with time and without your acknowledgement, lots of upsells and ones that often times you don’t need, and also constraints that don’t allow you to have full control over your sites/membership tenure. Be careful, don’t use Wix website. Wix is maybe the WORST provider ever seen. The Wix team always make false advertising everywhere. The Wix websites are totally unfunctional. No answer from support, or stupid answers with no solutions to problems. Also, SLOW websites, or if you made a page with very few (2 or 3) elements : They seem being able to give you a very nice and beautiful website but you can’t use it when you decide to use apps. It is totally false advertising. There are also many bugs. The only answer from Wix team, if we can call them a team, is to clean history and cache. Did you ever said to your clients : “hey buddy, if you want to access our website, clear your cache !! !” RIDICULOUS !!! Don’t forget that : with Wix, you have a low price initial webpage with advertising, but after ALL if you want anything decent you have to start paying. 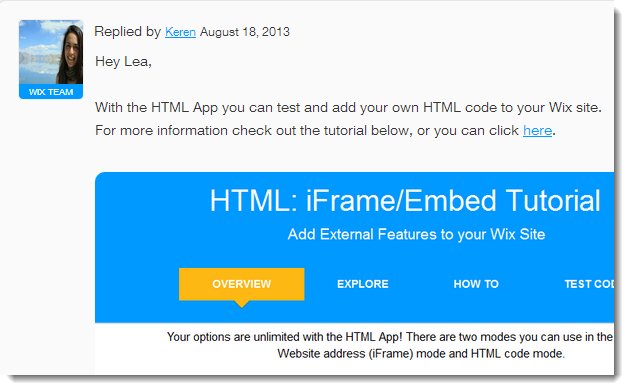 Never use Wix websites, they are dishonest and unscrupulous about their product and services. Just because a website is “live” doesn’t mean it goes directly into Google. It can take time for a website to get indexed into Google, a wix website or otherwise. This is based on your content and your overall authority within the search rankings. In saying this, any site that is on the .wix.com domain extension will not rank well at all. This domain has been flagged in Google as far too many people are harbouring stolen content, adult content and scams within the wix platform and you are immediately tied to this as soon as you create a free website there. I do recommend a platform like SiteRubix if you are looking to seriously build a business online and create a website that will rank in search engines. Worst company for excuses! They closed my accounts without even bothering to call and attempt in getting my new card information. Managers and supervisors are unbelievably rude! They said they sent me countless emails, and it’s very true. However it’s never just important emails, it’s countless spam emails that have nothing to do with your account, and after serveral a week, you just stop looking at your emails involving them period. I spam boxed their emails, of course I didn’t want them, so not knowing that the important ones went with them. Who fault is that? Mine or there’s? Now they use the excuse that they don’t have enough people, or have way to handle all of their clients that they can’t afford to call each one to maintain a relationship with them, when in fact they are the ones messing up your websites to start with. Don’t demand respect from your clients when you can’t afford to acknowledge issues with your bogus website builder/platform. For three months my account has been down, you would think I would have gotten a call? Nope! If you want a low quality service, one where your website is constantly down sometimes for months, then you should use wix.com. If you enjoy your sanity, choose a different website builder. Sorry to hear about your experience with Wix. Unfortunately you spent so much time developing your website on an inferior platform to many other offerings out there and I think that by sharing your horrible experience with not just the Wix website builder, but the support, will really help people make a quality decision. siterubix mentions a premium membership but i can’t find how much that costs. Can i start with siterubix and then use wordpress editor and move away from wealthy affiliate? A membership, which is included within the Wealthy Affiliate platform, is $19 for the first month then $47 thereafter. This includes 25 free websites and hosting for 25 of your own domains (total of 50) a state of the art website builder, 3,000 themes/30,000+ feature add ons, managed 24/7 wordpress hosting, tools and training for getting traffic to your website, mentorship from successful internet marketers, network…I could go on and on. It is in essence your all in one platform for creating, operating and scaling an online business. Wait, I’m confused. You said Wix was relatively expensive at $19.95 per month, but siterubix is more than double that for 25 ‘free websites’ (free for only $47 per month??)? I guess if you have 25 websites, $536 per year is pretty good, but if you only have 1 or 2, not so much. Still, I will check out their editor. I built a website on Wix, and it was super easy, and I loved the tools. If siterubix is better, then I can’t wait to see it! You actually get 2 completely free websites with SiteRubix, no obligations whatsoever and no “ads” on your site either. Wix’s comparable plan to this is one website with ads for $7 per month…and you will also have Wix branding all over your site. With Wix you are paying for sites on a proprietary platform, sites with limited functionality and have very limited clout within the search engines. SiteRubix is built on the WordPress foundation, the most popular platform for build websites in the world. In fact, 30% of all websites are built using WordPress. There are over 3,000 themes included and over 30,000 plugins that you can use to extend the functionality of your website within SiteRubix. Not to mention the fact you get full training, live classes, up to 50 websites on the state of the art hosting platform, support from experts, keyword tools, other management tools, website feedback tools, SiteHealth metrics, etc. Just a little perspective here Brad. hi again….ok wix is not the best,i am a artist so i need a picture based site,i am only a novice around the computor so i need an idiot proof web builder site i can do myself and get it on line quickly,can you recommend a web builder……………….something free would be good,but i am willing to pay if it does the job unlike wix. I highly suggest that you move into something that is WordPress based. It is the most widely used website platform in the world and for good reason (approximately 30% of all websites are WordPress based). You can get 2 free websites over at Wealthy Affiliate…along with marketing training to help you with promoting your work online and support form industry experts. If you know what you are doing, getting ranked should happen within the first 7-10 days after you initially launch a website. Wix sites have had frequent issues ranking in search engines in particular if you are using the free version of their service. Their paid service is very limited compared to other platforms like WordPress, so I would honestly consider moving over to a platform that not only provides you with superior websites to that you will get wix, but also provides you with training so you can learn how to properly get indexed in Google and other search engines. I suggest you check out Wealthy Affiliate, it is completely free to get rolling. Kyle, thank you, I thought it was just me. I also created my website 2 weeks ago and still cannot find it using Google Advanced search. I’ll check out the other sites you mention, even if I have to start from scratch rebuilding my website. You will rarely see wix sites rank that well. The problem is that they are not very well optimized for search engines and the fact that don’t filter or regular the type of content that is added to their domain URL contributes to very low rankings in Google, in fact in many cases they are red flagged for things like adult content, duplicate content, and harboring copyright fraud. There are much better platforms for building website and it is truly my belief that unless you are building WordPress websites (or you have a huge operating budget), you are going to be left in the dark ages. You can also get WordPress websites on a far superior hosting platform than Wix for completely free. I have been thinking about moving to a different provider, but I don’t know how to move the website address – is that what you call the domain? Hard to believe that I actually set up my current website myself, but I did – even not knowing what any of the major terms meant. And the email storage is way too small. This is done through updating your DNS settings. First you need another hosting company before you can transfer your domain. You would have to inquire first about getting another host (Wealthy Affiliate offers premium managed hosting, one option) and then you will need to consider updating your DNS to point to your new host. The new host provides you with these details once you have paid for the service. Want to build a site to get info out to Veterans of Foreign Wars. What builder would you recommend that a newbie use? A website is like a blank canvas and you can use any platform that you like, but personally I favor WordPress websites because they are the most supported out there and they offer the most functionality out of any website out there. You can get a free WordPress website if you head over to siterubix.com and within minutes you will have access to a website and one that is ready for you to build targeting whatever topic you like Mike. Please give direction to put my Wix website in the search engine, because when I search my website on Google or Yahoo it does not appear. Is it because Wix sites do not rank? Unfortunately Wix websites do not rank well, in particular the ones on the .wix.com domain name (the free sites). The problem is that when you build a free site on Wix, you are on the same domain as millions of other often times low quality sites that have been punished by Google and other search engines for their low quality content, duplicate content, or infringed content. This automatically carries through to your rankings and this is likely why you are not ranking. If you want to create a successful business online, you want to be on a more widely supported platform like WordPress. You can get a free WordPress website by heading over to Siterubix.com. As I am very new to the tech scene I have built a web site using wix.com I too have searched for my site even after upgrading to a premium package and still cant find it ..they say give it some time shouldn’t my site be published almost instantly my craigs list ads are my facebook ads are why would this site not be ? Unfortunately Wix sites don’t rank very well, they never have. If you are planning on getting ranked online, you should absolutely consider moving to a WordPress platform for your domain (like the ones offered at Wealthy Affiliate) as they are not only much more powerful, robust and SEO friendly sites, they are used by over 30% of all webmasters online (100’s of millions of websites) and that is for good reason. This is a very great article. I was just taking a look at wix website after i got frustrated publishing a site I developed using Front Page. I have a domain name and I created a word press blog. (Content Journal). Can i build a website using WordPress? Yes, you can and should be using WordPress. It is much more powerful and offers a lot more features and functionality than Wix websites do. You can get a free WordPress website (two actually) and use our state of the art Website builder at Wealthy Affiliate. I actually like Wix lol I mean, I love SiteRubix more but my first website building experience was with Wix and It was easy for me to use. I do agree with that ridiculous branding on the free sites. I feel like the whole world doesn’t need to know you cant afford to pay for your website lol So for that reason I only used it for my hobbies and nothing business related. As for their limited themes, to me I actually created nice websites. I think that’s because I’m not new to computers and I understand the editor well. You don’t have to just stick with those templates. You can completely redesign the website any way you like. I have never stuck with the templates. I would build it from scratch using the editor. However if you are looking at it from a newbies perspective then I can see how frustrating that is. The support on the site is definitely more on the technical side. It is just one big forum and sometimes It can be hard to understand what they are talking about. The new editor that you talk about in the review is a little annoying. It wasn’t always like that, I don’t know why they would make things more complicated lol It used to be much simpler. They have to evolve in order to compete with the other, more established platforms out there like WordPress. Wix definitely will appeal to some folks, but it has its limitations and if you take a few minutes to learn WordPress, there is no way you would ever return to building Wix sites. Glad you are enjoying WA and your experience with SiteRubix! I have no idea on how to create a website. I want one that generates 5ocklock traffic. I created a wix website an didn’t publish as I read this. How do I achieve this? Head over to SiteRubix.com and build a website there. You are going to be building a full WordPress website there and that is far superior to anything you can create using the Wix platform. WordPress is used by over 30% of all websites online, Wix is used by far less than 1% (just to put things into perspective). I love how you say ‘I have years of experience (11 years now) building websites and I still find their editor somewhat difficult to use’ Ha I totally agree. I have 5 years website dev. experience and I still have trouble figuring out what all the buttons do on facebook. I always say, I didn’t make the site how am I suppose to know how to use it. Great article! Wix sure does have a lot of options, no wonder it is still a bit complex for anyone to use. Yeah, they are honestly 10 years behind WordPress and they will never catch up. The Wix platform is not good for newbies or those with experience. Unfortunately they have just landed an IPO so they have a lot of marketing to throw at their business, capturing a large crowd of people that are new to websites and don’t know any difference. This is a great review and very helpful Kyle I’m glad I came across this information. Ive been playing around with WIX and found it fun but I did find templates to generic and limited and the site tricky to use. Ill definitely check out SiteRubix and WP as you recommend. Im looking to build a design led site that I can sell from in the future is SiteRubix good for this also? I was also looking at SquareSpace as people have recommended this, but again I guess similar problems as WIX being limited in its ability to customise the templates. WordPress hands down (which SiteRubix runs on). I would not suggest anything else, I have been building websites and there is a community of MILLIONS of developers behind the advancement of WordPress. It is the most widely used platform for a reason and I know you are going to love how easy it is to use. I consider myself a fairly knowledgeable website builder, having put together websites from scratch before, yet I can’t get my head around wix. I’ve tried them on a number of occasions and I just don’t find them user friendly or ‘warm’. I think your assessment has been more than fair. Yeah, there is absolutely no comparison using this platform versus an establish and widely used platform like WordPress. Wix is difficult to use, very limited and in my opinion overpriced for what it is. Thanks for your feedback Miche, I think it will be very insightful for my readers. I’m a little unclear about the wix advertising. If you purchase one of the plans, it claims there is no Wix advertising banner. Is this correct? IF you get their Connect Domain plan ($80+ per year), there is going to be advertising on your website. If you don’t want this, which you shouldn’t, then you are going to have to invest in one of their more expensive plans ($300-$400 per year). Remember this is not going to include your domain expenses, any training, any real website/marketing help or the tools you are going to need to run a successful website online. This is why I highly recommend the SiteRubix.com platform to you as it includes all of this Robert. where is the best place to get a domain? I personally use namecheap.com for most of my domains simply because they are affordable, realiable, and they don’t have a million upsells (like places like Godaddy have). Yeah i do have a Wix website and the brand at the bottom of the page its quite a turn off. Yeah, it consumes your audiences interest and definitely devalues your website to any visitor. You should consider using WordPress for your websites Tshidi, you will be much happier with your control and if you use services like SiteRubix.com you can get 2 free websites (ad free). The things that would bother me most would be 1) having unwanted ads at the bottom of my site, and 2) that there isn’t any training on how to get traffic to your site. If you have a hobby site that you want to show to friends and family, Wix could work. But if you are building a business out of it, it seems to me that (as a newbie) you would need something with a bit of training and advice as far as what to actually do once the site is built. Even if you build it, they might not come! I agree Nathaniell, you are essentially building a website that has next to no purpose at all (no training on what to do with your sites). Wix sites also don’t rank, which serves no SEO value to creators and if you use it as a hobby site, then you are going to have your blog stuffed with Wix branding and promotions…which by the way you don’t get credit for. Just remember, you get what you pay for…. Thanks for this review it makes sense and I’m glad I came across this, I’ve never used wix to build, but have used other “free” sites and don’t like to have it branded. Very interesting, and I do like the WordPress method and the community involved is awesome too! Thanks! Thanks Matt. Yeah, it is a real turn off having half of your real estate being branded with Wix within the free version. Also, the free aspects of Wix are very limited and if one is looking to get started online with a free and powerful WordPress website (the most widely used platform), then SiteRubix.com should definitely be the choice. It gives full flexibility in respect to the niche you choose and also the promotions that you put on your site, completely brand free, and includes the training and community you need to effectively build a business. I think that ease of use should never compromise your array of options, but merely let you mix and match with greater ease. Wix clearly does neither so I would definitely want to go with wordpress. The fact that WordPress is the most widely used gives it the added benefit of having the most people adding to it’s already massive array of options. This includes hundreds of free themes as well as paid if you want to be a special snowflake. WP was a little difficult when I first started using it, but I see now that once you get past the learning curve, it offers a ton of customization (although some options can be theme-dependent. I agree Chip, WordPress is not only the most widely used platform in the world for building websites it is also the most widely supported. As a user you have access to 1,000’s of themes (10,000’s if you include the paid ones) and 10,000’s of feature add-ons. There is no proprietary platform (Wix or otherwise) that can compete with this. If you are serious about creating a website and a business online, getting a website up and running using WordPress through a builder like SiteRubix.com is a no brainer. Yeah, it is quite frustrating to use. Unlike WordPress that has millions of people within their community actively improving it, Wix has a few employees working to improve their system. There is no way they can keep up or innovate as fast and there is honestly 100x more functionality within an open platform like WordPress. I recommend that anyone interesting in getting a free site up and running really does consider SiteRubix.com as it will lead to an immediate WordPress website. Hmm, I took a look at that Wix page you made. I can certainly see the potential behind these templates, but from my experience, content sells better than how your site looks. Having also been someone whose used SiteRubix, I believe it’s the better option (it’s also free). I’d recommend starting off with this option first. I doubt you’ll need another website maker after. Just my thought. Yeah, they are definitely not bad looking themes by any means. The main problem is the theme choices are limited and too niche specific. If you want a hunting site, you are going to have the same hunting site as 1,000’s of other people. WordPress gives you far more flexibility in respect to your look and design with their wide range of “raw” themes that you can easily make your own. A very comprehensive review Kyle. Although Wix clearly is popular I couldn’t get on with it at all. Siterubix.com is a much better option for beginners. Most definitely, Wix is popular in most part to their big marketing budget. For anyone that has used WordPress that tries Wix quickly realizes how limited it really is. I don’t have much to say about Wix, but I will spare you most of my experience with them and just tell you what really peeved me off. OK, so I bought their mid grade package and got a domain up and running on their site. I was kind of happy with it, but then 10 freakin’ sites out there were exactly the same as mine. There templates are too specific and you can’t really customize to look different than your neighbors. Then, I decide to move my domain (DNS update, techy jargon) and they wouldn’t let me. They said I had to move my domain to another company completely which is a 20 step process. That is a total scam and I have never seen a domain host do that to you. So avoid Wix if you can. There sites aren’t that great and you have very little choice. Ouch, sorry to hear about your experience Keith. I have actually heard others complain about it being difficult to move domains that you purchase with Wix. I guess this is their way of “locking you in”, albeit a very unethical way. I like you have never heard of any company tying down your domains DNS settings like this!